Not to be confused with Kurdish Republic of Ararat. Approximate extent of the Republic of Mahabad. Iran is shown in dark grey. The Republic of Mahabad (Kurdish: کۆماری مەھاباد‎, Komara Mehabadê; Persian: جمهوری مهاباد‎‎) was an official state in present-day Iran. The capital of Republic of Mahabad was the city of Mahabad, in northwestern Iran. The state encompassed a small territory, including Mahabad and the adjacent cities of Piranshahr and Ushnaviya. The republic's foundation and demise was a part of the Iran crisis during the opening stages of the Cold War. In the town of Mahabad, inhabited mostly by Kurds, a committee of middle-class people supported by tribal chiefs took over the local administration. A political party called the Society for the Revival of Kurdistan (Komeley Jiyanewey Kurdistan or JK) was formed. Qazi Muhammad, head of a family of religious jurists, was elected as chairman of the party. Although the republic was not declared until December 1945, Qazi's committee administered the area for more than five years until the fall of the republic. The Soviets were generally ambivalent towards the Kurdish administration. They did not maintain a garrison near Mahabad and also did not have any civil agent of sufficient standing to exercise any great influence. They encouraged Qazi's administration by practical benevolent operations such as providing motor transport, keeping out the Iranian army, and buying the whole of the tobacco crop. On the other hand, the Soviets initially did not like the Kurdish administration's refusal to be absorbed into the larger Democratic Republic of (Persian) Azerbaijan, and discouraged the formation of an independent Kurdish state. The Soviets allowed for the safe passage of Mustafa Barzani and his followers into the Soviet Union following the fall of Mahabad. Unity and fraternity with the Azerbaijani people. The establishment of a single law for both peasants and notables. Map of the Republic of Mahabad in 1945-1946. However, its close relationship to the USSR alienated the republic from most Western powers, causing them to side with Iran. Qazi Muhammad did not deny that his republic was funded and supplied by the Soviets, but did deny that the Iranian Kurdish Democratic Party (PDKI) was a communist party. He claimed that this was a lie fabricated by the Iranian military authorities, and added that his ideals were very different from the Soviets'. On December 15, 1946, Iranian forces entered and secured Mahabad. Once there, they closed down the Kurdish printing press, banned the teaching of Kurdish language, and burned all Kurdish books that they could find. Finally, on March 31, 1947, Qazi Muhammad was hanged in Mahabad on counts of treason. Mustafa Barzani, with his soldiers from Iraqi Kurdistan, assisted the Republic's forces. After the fall of the republic, most of the soldiers and four officers from the Iraqi army decided to return to Iraq. The officers were condemned to death upon returning to Iraq and are today honored along with Qazi as heroes martyred for Kurdistan. Several hundred of the soldiers chose to stay with Barzani. They defeated all efforts of the Iranian army to intercept them in a five-week march and made their way to Soviet Azerbaijan. In October 1958, Mustafa Barzani returned to Northern Iraq, beginning a series of struggles to fight for an autonomous Kurdish region under a newly formed party called the KDP, carrying the same Kurdish flag that was used in Mahabad. Massoud Barzani, the President of Iraqi Kurdistan as of 2015, is the son of Mustafa Barzani. He was born in Mahabad. "The Republic of Kurdistan: Fifty Years Later", International Journal of Kurdish Studies, 11, no. 1 & 2, (1997). 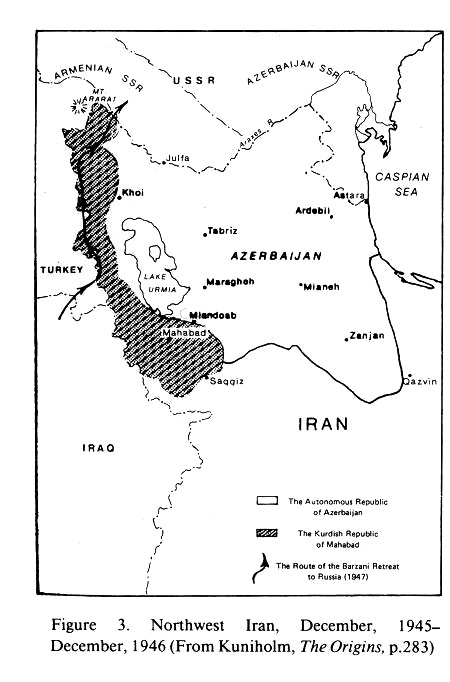 Archie Roosevelt, Jr., "The Kurdish Republic of Mahabad", Middle East Journal, no. 1 (July 1947), pp. 247–69. Yassin, Burhaneddin A., "A History of the Republic of Kurdistan", The International Journal of Kurdish Studies, 11, nos. 1-2 (1997): 115-240. Yassin, Burhaneddin A., Vision or Reality: The Kurds in the Policy of the Great Powers, 1941-1947, Lund University Press, Lund/Sweden, 1995. ISSN 0519-9700, ISBN 91-7966-315-X Lund University Press. ou ISBN 0-86238-389-7 Chartwell-Bratt Ltd.
(Russian) Масуд Барзани. Мустафа Барзани и курдское освободительное движение. Пер. А. Ш. Хаурами, СПб, Наука, 2005. (Russian) М. С. Лазарев. Курдистан и курдский вопрос (1923—1945). М., Издательская фирма «Восточная литература» РАН, 2005. (Russian) Жигалина О. И. Национальное движение курдов в Иране (1918—1947). М., «Наука», 1988. (Russian) История Курдистана. Под ред. М. С. Лазарева, Ш. Х. Мгои. М., 1999. (Russian) Муртаза Зарбахт. От Иракского Курдистана до другого берега реки Аракс. Пер. с курдск. А. Ш. Хаурами. М.-СПб, 2003. The Republic of Kurdistan in Mehabad, Encyclopaedia KURDISTANICA. Proclamation of the Kurdish Republic of Mahabad from The Encyclopedia of World History Sixth Edition, Peter N. Stearns (general editor), © 2001 The Houghton Mifflin Company, at Bartleby.com. This page was last modified on 24 April 2016, at 21:45.